Felt is another obsession of mine. Not only do I love the aesthetic but also 100% wool felt is water-resistant, and environmentally friendly, and incredibly durable. Did you know that wool felt was one of the world's first textiles? Yep, goes back to 1500 BC possibly before, when people realized the potential of sheep's fleece. The earliest forms were found in Central Asia where felt was used for shelter, flooring, and clothing. There's a little history lesson for you. Anywho, I am a sucker for the charcoal gray but felt comes in any color imaginable. The following are some of my favorite applications of felt...All of which you can do yourself! Felt Headboard Check out this subtle yet effective transformation of this headboard using industrial charcoal grey felt. Simple DIY instructions here. Love a simple felt pillow and have been seeing the sprout up an many retail stores but you can make them yourself quite simply. To make you own, click here for basic instructions from Ehow. Pillows above available for purchase from Filzfelt, a new shop formed by Boston designers Kelly Smith and Traci Roloff. 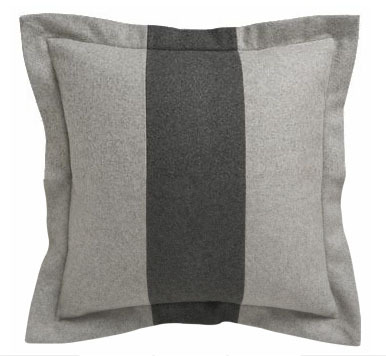 Also check out CB2 for one of my favorites, a wool blend bold stripe pillow in charcoal grey/oat. Mailing Tube Wine rack I love cute little felt accessories like this. This little wine rack is a great for showing off your wine in a small studio apartment. The components are simple: felt, colored duct tape, and mail tubes...I have so many of these tubes floating around from trace rolls and storing drawings. Click here for instructions on how to make this rack. I have been digging the look of felt rugs, since I found this great zippered grey felt rug by Jim Zivic, click here to view. Planning a DIY project myself: I am planning on purchasing several large pieces of wool felt and seaming them together using zippers for a custom look. Another idea is to purchase the rugs from vendors such as FilzFelt (above photo from Apartment Therapy) and Peace Industry (below left). Not to mention another fave, Flor (below right) where you can create a custom looking rug using Flor tiles. I think of anything with a custom component as being DIY!